Blend first 4 ingredients in blender until smooth. Press through wire mesh strainer into medium bowl. Add meat; mix lightly. Thread meat onto 24 skewers. Add pineapple. Grill 5 min. or until meat is done, turning occasionally. Meanwhile, blend avocado, mayo and serrano chile in blender until smooth. Remove meat and pineapple from skewers; place on tortillas. Top with avocado mixture, onions and cilantro; roll up. Serve with lime wedges. 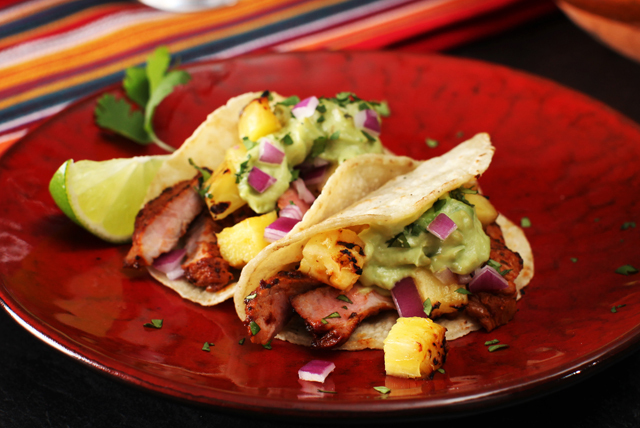 Tacos al pastor are a favorite Mexican street food made from pork marinated in a secret sauce before being topped with pineapple and cooked on a rotisserie. They are served in very small tacos (just 2 bites), topped with cilantro, chopped onions, pineapple and hot sauce. Mini corn tortillas can typically be found near the butcher section in Mexican grocery stores. They are great for use in the preparation of appetizers, such as these tasty tacos. Customize this recipe by preparing the marinade with your favorite combination of chiles.